Surrender and Allow is 33 minutes. This meditation takes you on a journey that will help you when you feel stuck or trapped. It can help with a wide variety of experiences that go with these emotions. It can help you to work on deep, emotional traumas that have affected you or whole life. Or it can be used in a time when you aren’t sure what’s holding you back, you only know you want a change. Often times we forget that surrendering and allowing go hand in hand. Perhaps you are ready to allow a big change in your life. You want to allow a promotion to come in, or a new relationship. In order to do this you must first accept where you are and surrender to it. 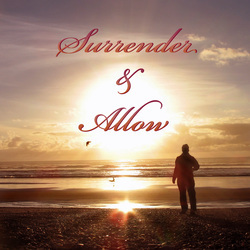 This point of surrender will cease all resistance you might be experiencing, both consciously and subconsciously. On the flip side, if there is something you just cannot seem to let go of, no matter how hard you try, then you must allow in whatever it is you want to replace it. If you want to surrender to your anger then you must allow in the peace that will carry you forward. Although it can be scary to face things we must surrender to, this meditation will guide and relax you through the entire journey. You will be guided into using visuals of the moon, the ocean tides, a warm breeze and the golden rays of the sun. Each step of the meditation will flow to the next, and before you know it something will have shifted inside you. While you enjoy the guidance background music written by professional composer Christopher Llyod Clarke plays. The music contains theta brain waves created through binaural tones. These tones will help ensure that you can truly gain the clarity and quiet of mind that you seek. Tibetan singing bowls, celestial choirs and pure bells on the this track, Constellation, blend perfect with the sound of ocean waves that begin after the introduction.